This aventurous cave tour is known as "Adventure Kuelscheier" due to the walk through narrow rock passages and the dark crevice Kuelscheier which is more than 100 meters long. The starting point Op der Gare, a former train station, is marked by the mounted US aircraft bomb from the Second World War that was found nearby. The path first leads through the village Consdorf, where you will pass typical farm houses and the oldest house of the village, built in 1756, in the street Huelewee. From there on, you exchange residential streets for a narrow meadow path that leads you past a small spring, locally known as Nidderbierchen or Nidderbierchelchen, towards the valley of Härdbaach. 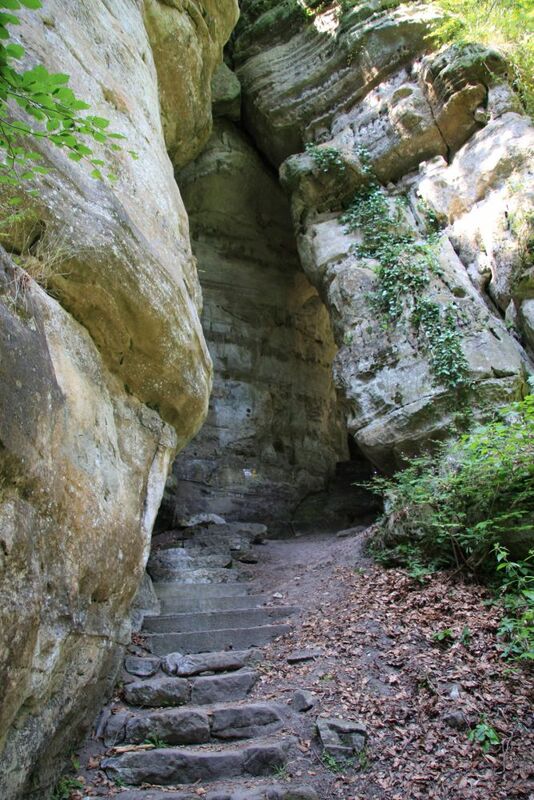 After a few hundred meters up-creek on a wide forest trail, a small path with many stairs veers to the right and leads to two very narrow passages between rock formations Rittergang and Déiwepëtz. The stunning crossing through the pitch-black rocky passage Kuelscheier is without a doubt the highlight of this trail, as well as exploring the fantastic area of the Adventure-Kuelscheier. An ascending path alongside several swamps in the forest plot Seiert will bring you to the starting point again. Bring a flashlight or use the torch on your phone on this trail!